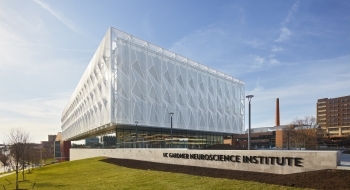 UC Health, University of Cincinnati’s academic health system, opened the University of Cincinnati Gardner Neuroscience Institute, a major advance in healthcare architecture for patients with neurological disorders. Research suggests that dementia, epilepsy, headache disorders, multiple sclerosis, stroke, Alzheimer’s disease, Parkinson’s disease, and other neurological conditions are a growing cause of death and disability worldwide. For those patients, innovation in architecture and design—as is the case at the UC Gardner Neuroscience Institute, designed by Perkins+Will—offers the promise of improved well-being. • A unique façade that prevents glare and visual disorientation: The facility’s exterior is made of a specialized polyester fiber mesh that controls light and heat, and prevents glare while allowing natural light to enter the interior. This is critical for many neurological patients, as glare can be visually disorienting. Wrapping the east, west, and south sides of the building, the angular, pleated, polyester planes, which are 10-feet wide and 3 stories tall, suggest origami, and make the building stand out on a campus known for classical and modern architecture. • Light-filled corridors for comfort and visibility: On the exam and clinical care floors, patients move along exterior corridors lined with windows, rather than down disorienting dark internal pathways. • Exam rooms that accommodate families for extra patient support: Exam rooms with wide sliding doors are grouped in flexible pods and can support specialty procedures nearby, easing patient and family access. The larger exam rooms accommodate medical teams, family, and caregivers. These floors also include MRI, infusion, and special procedure rooms. • Spaces that account for patients’ auditory sensitivities: Walls between exam rooms are acoustically sealed, with the gypsum board and acoustical insulation going to the structure above. Doors into exam rooms went through specialized testing to confirm they also met the same stringent sound transmissions goals to ensure minimal disruption to patients with auditory sensitivities. For patients with mood and memory disorders who seek quiet spaces with fewer stimuli, enclosed spaces are available within the main waiting areas. • A lobby that prevents vertigo: A large atrium can trigger vertigo, so a daylit lobby designed on a more human scale welcomes patients upon arrival. • A variety of spaces allows for diverse activities: The ground level includes an outdoor garden, flexible space for community, teaching, and patient activities, with an auditorium and rooms for dance therapy classes. • A kinder, gentler parking garage to ease the anxiety of arrivals and departures: Patients with ambulatory challenges described typical parking garages as a highly stressful, anxiety-inducing experience due to lack of light, confusing signage, echoing noise, and sloping garage floors. Every garage floor is on a flat surface, with an easy-access entrance and exit from the elevator to each of the patient floors. Windows along the north side of the garage provide daylight and help orient patients returning to their cars. • Accessible research space: Located between the staff and patient areas, these spaces encourage collaboration among specialists as they evaluate studies, clinical trials, and data.